Sandro Magister has a most interesting article about a two volume work by Carlo Fantappiè entitled "Chiesa romana e modernità giuridica (The Roman Church and juridical modernity)" which looks at the Code of Canon Law promulgated by Pope Saint Pius X. 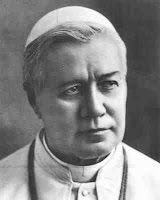 (See: Saint Pius X, a Backward Pope? No, an Unprecedented Cyclone of Reform) He appends a review of the book by Gianpaolo Romanato. The thesis is that far from being a static, reactionary pontificate, the reign of Pope St Pius X was a cyclone of modernisation in response to the changed conditions in society that had developed during the 19th century. The code of canon law made possible a disciplinary and administrative uniformity that enabled the Church to deal with the modern nation state. The effect of this centralisation and the increased emphasis given to papal authority within the Church certainly brought about many positive developments. Regarding the Liturgy, however, as Alcuin Reid pointed out in his work "The Organic Development of the Liturgy, there were some elements that could be judged in a less favourable light: for example the wholesale revision of the psalter of the Roman Breviary which resulted in the transformation of the Divine Office so that it lost its continuity with the ancient Roman office. Similarly, the introduction of the idea of "partecipazione attiva" (the original expression was in Italian) has left us with problems that the Church still continues to wrestle with. Pope Benedict's concept of the "hermeneutic of continuity" can be seen, 100 years later, as an important corrective to this conception of papal authority. With no little humility, our present Holy Father has highlighted the responsibility of the papacy to respect the liturgical tradition of the Church.